Took a while but I found a good use for peat moss. As most of you know, I don’t recommend it for potting soil or bed preparation. Why? It’s basically anti-microbial - just the opposite of what we want. Compost and coir work better, cost less and do a great job of stimulating biological activity in the soil. However, peat moss is great for storing bulbs, tubers, roots and other things that you don’t want to rot. The picture shows the Irish potatoes at home that have been in dry peat for months. We ate some last evening and they were still great. My only mistake was leaving the wash tub with the experiment out on the back porch - under the eave. 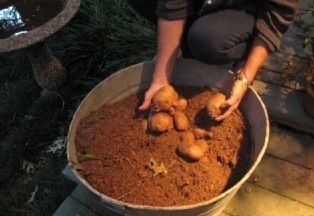 It got some moisture and a few of the potatoes’ “eyes” tried to start growing. This wouldn’t have happened if I had kept the experiment in a dry, cool condition - which I will do next time. This storage idea will also work for tulips, garlic, hyacinths and any other plants that need some protection and storage out of the ground. This is probably the very best way to save and protect your own seed source for potatoes, garlic and other foods. If you have any questions about this newsletter or any other topic, join me this weekend for Dirt Doctor Radio shows.